It was a very good lunch indeed! Thank you. My favourite sandwich bread. Looks like you have this one down for sure! What a great looking crust and crumb and some nice photos to boot. Looks like it can almost melt in your mouth. Ian, thanks and you hit it on the nail with the melt in your mouth comment. I have no idea what I did differently in my last Tartine bake and this bake, but the crumb turned out VERY soft and 'melt in your mouth' in both loaves. I aint complainin'. Really just fantastic looking. What is your seed mix? Good to see a post from you. I thought maybe the Rye beat you. Thank you Josh. It was actually higher % whole wheat loaves that threw me for a loop. I'm getting the hang of it now though. I learned that I was severely over proofing. I used: Flax, sunflower, pearl barley, oats, and crack wheat. I toasted them to the edge of almost burnt before adding to my soaker. Really makes a difference to the end flavour. seed mix. It's pretty close to what I used last in the 5 grain levain out of bread. But with pearled barley and no rye. But I did not toast. I'm gonna give that a whirl and see if I like it better. High % Wheat loaves are in a sense the same changes. Faster fermenting grain so less levain should be used to give time for dough development. I've had my best results with cold bulk retarding with the very high % loaves. Very Nice Bake and I'll be trying this soon. Got some dried figs too and dmsnyder's miche all on the to do list. Great Loaf!!! Its perfect inside out. Whats the % of whole wheat did you use in this loaf. I think I need to take on a loaf like this, it just looks too good. How long do u have to soak the grains? Last time I soaked the cracked wheat its kinda tooth breaking for me. Thanks CeciC. WW is about 20% and the soaker was with boiling water overnight. I have absolutely no cracked teeth but lots of soft cracked wheat, so it worked for me! Happy Baking and thank you for the comments. Such beautiful bread! Can you tell me the formula you used? Also, what steaming changes you made. Thank you ml...I didn't make any steam changes to this loaf in particular. I did however, stop placing a can of boiling water inside the turkey roaster a few months ago. I realized the hydration in the dough releases enough steam as it bakes and when using a tight lidded baking vessel such as my turkey roaster, it steams it quite nicely. I will post the formula to you in a PM. Some fine looking loaves John. The pictures aren't too shabby either. Really nice baking. I appreciate the comments Syd. I am not much of a formula poster, and with my new camera, I am over doing the photos, but can't help it. These are just beauties John. Thanks a bunch for all the kind words dabrowny. Yes, I have found new appreciation for the turkey roaster. Also found a few different sizes shapes at my parents place. One for boules, one for batards, and a larger one for short baguettes. If I ever try baguettes again. Been a while. Well thank you Phyllis. So do I, which is why I bake this one more than any other bread. The breads looks delicious, John! This is one of my favorite varieties for flavor. You did a bang-up job! Thank you David. The slow proof in fridge makes all the difference. Thanks! I don't know if I will ever use it for turkey, but I will never give it up for bread baking. Hope one finds its way into your home in the near future. Great work there John, the loaves look fantastic. I see you have a loaf on parchment there inside your roaster. I've tried this as well but I've had the parchment actually sticking to the bottom of the loaf when its done. Has that ever happened to you? Thank you for the comment. Actually, that loaf in the photo stuck a slight bit to the parchment when I took it out, but was very easy to take off. Typically, when I bake my loaves, I undercover the roaster after the steaming portion of the bake, then I let bake for about 5 minutes in the roaster without lid. This allows the bread to harden a bit (made the mistake once trying to grab the loaf out of roaster too early and I squished it since it was still too soft). I then take the loaf out of the roaster, remove the parchment (if it sticks), and place directly on the tiles that the roaster was sitting on. That is my method. Parchment usually doesn't even stick to the loaf with very high hydration loaves such as Tartine Country Bread. Perhaps you should try a different brand? Yes, I'll definitely try a different brand because its really disappointing to pull out a nice loaf from the oven and then find stuck on bits of parchment on it. The night before baking, build the liquid levain by mixing together all of the ingredients in a medium bowl. Cover and let sit at room temperature (70 degrees) for 12 to 16 hours. Also the night before, prepare the soaker by mixing together all the dry ingredients and then covering with boiling water and stirring well. Cover and let sit at room temperature. On baking day, place all ingredients of final build and the levain (excluding the salt), in a bowl and mix until well combined. Let the shaggy mass of dough sit, or autolyse, for 40 mins. After autolyse, add the soaker and final build salt. Knead until a medium gluten development is achieved. Transfer the dough to a lightly oiled glass bowl or plastic container. Cover and let bulk ferment for 2 hours at 78 degrees. Stretching and folding twice after 50 mins each time. Return to the bowl (seams down) and let rise for the remaining time. Remove the dough, flatten and pre-shape into round. Let dough rest for 15 minutes then shape into batard or boule. Cover in plastic and retard proof in fridge overnight (or you can let proof for 1 hour at 78 degrees). Preheat oven to 475 degrees. Turn heat down to 460 degrees, slash and bake with steam for 25 minutes, then without for 20 minutes. Internal temperature should be between 200 - 205 degrees. For best oven spring, bake straight out of fridge. You can try but I don't think you will be impressed with the results! I don't know the difference between pot barley and regular barley. I just see it labelled as such in the grocery stores. Probably one is more meant for cooking in a pot, such as soups and stews? Not sure. A loaf to be proud of. Thanks a lot. I was proud way back then. I will be baking this bread again soon. 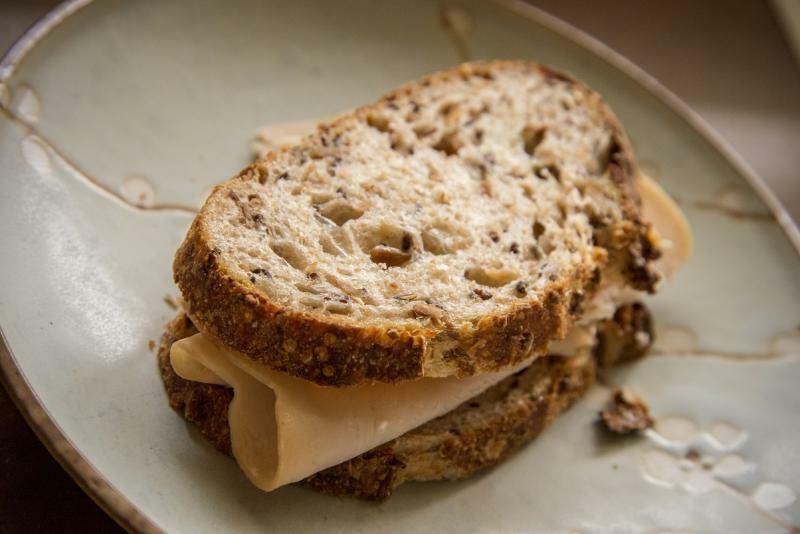 Is this still your go to recipe for a multi grain bread or do you have a different one now? Looks amazing.